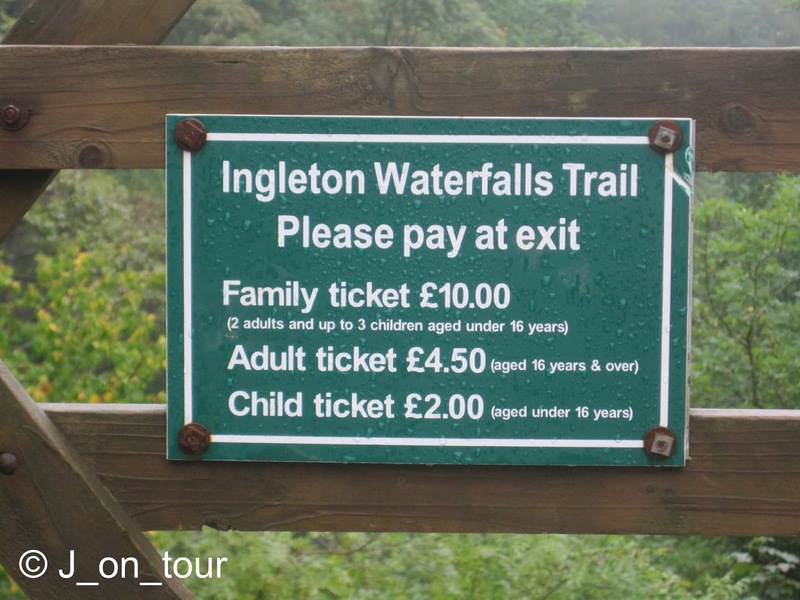 The Waterfalls walk is a 4.5miles (8km) well trodden path, triangular shaped route on a private land path that has been popular with people since Victorian times. On leaving the town of Hawes, the weather improved marginally enough to press on with our journey towards the previously mentioned Ribblehead viaduct. Although I had been down this road twice before, I didn't realise the serious height gain on the road as we climbed slowly up the hill. This was made more noticeable by the low lying cloud that we had entered !! 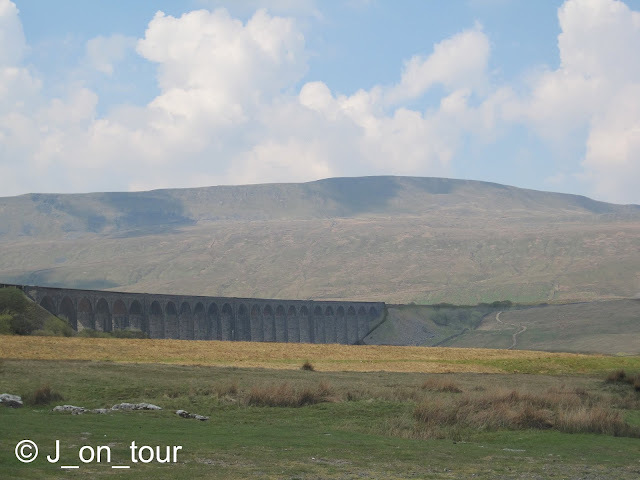 We had hoped to see the summit of Whernside at one stage but I gave up that idea rather quickly because on reaching Ribblehead, we couldn't even see the viaduct far less the mountain behind it. I had a reserve walk option up my sleeve of something a bit lower, less exposed, scenic and possibly worthwhile considering the amount of rain in the last few days at Ingleton. Apologies to the hardened walkers out there reading this..... yes, I know.......the last time I did this walk was when I took my Mother for a long day out in the car many years ago. I knew that there might be an entrance fee into the grounds but unfortunately it was a long time ago and it was a bit difficult to accept that it was going to cost £18. The ticket salesman did mention that we had free parking, but he couldn't understand the argument that it would cost the same if we had arrived in four cars. It seems to be a long standing tradition that people place small amounts of money in certain specified tree trunks as either a good luck charm or a wish. I was wishing that the weather had been better & thinking..... I wonder what the gatekeeper does with all his small coins from the entrance fees !! Over the edge.... for Thornton Force ! 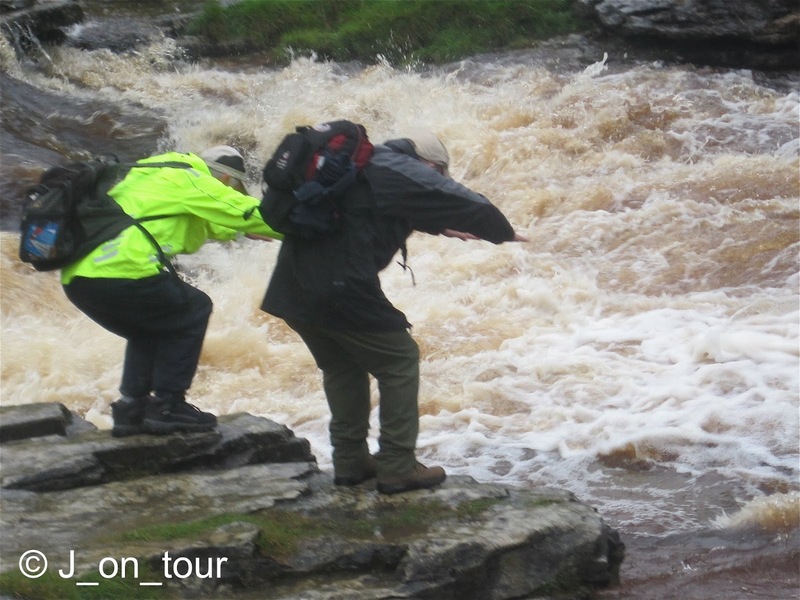 My fellow walkers decided that it was just as wet outside the water as it was in, so they threatened to dive in !! We eventually reached the top of the hill and crossed the river. 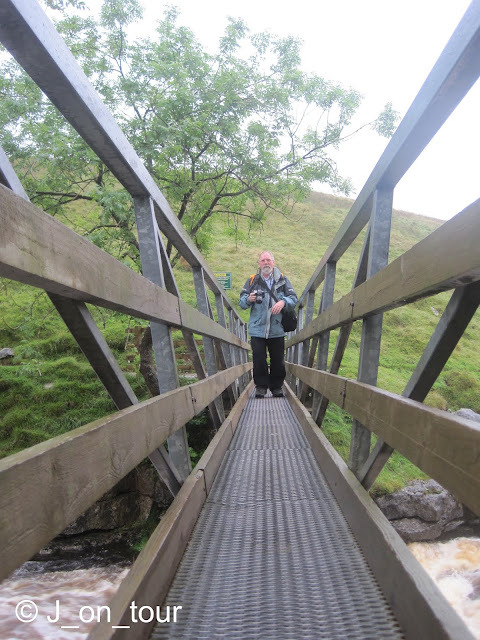 The remaining member of my group is spotted on the bridge trying to capture an illusive photograph before me. I was going to leave this photo out as I spent a lot of time with the four image options I collected. I quite liked the angles of the posts, tried several variations but wasn't happy with the result with no-one on the bridge. I haven't had time to ask for permission to publish this yet, my friend has become faceless, sorry to him!! vanishing point... well, not quite ! 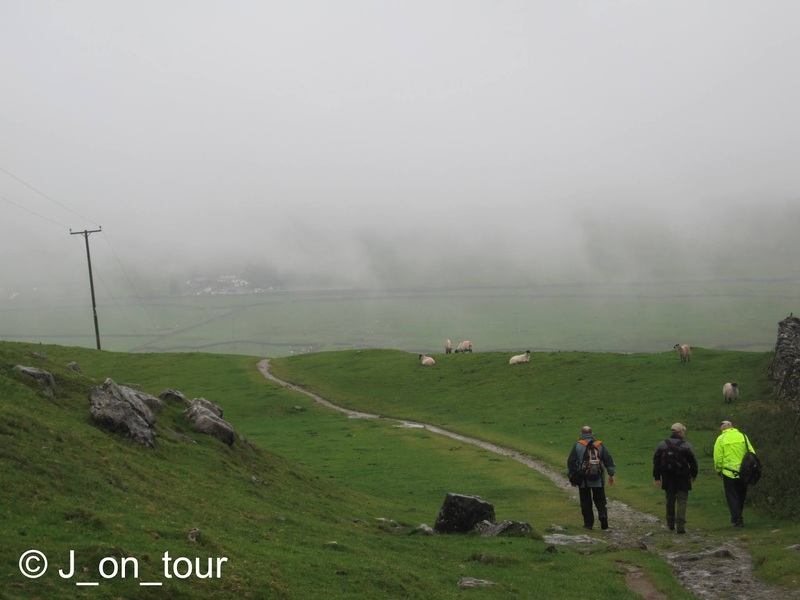 Lastly, even though the walk was only 4.5 miles long, the rain started again and it seemed like a long time before we arrived in Ingleton. You know it's a bad sign when a dog keeps an eye on the weather !! . At least all the rain makes for a spectacular waterfall. So that is how it should look. It really is worth the money after rain. You have captured it perfectly. Looking at your photos, there seems to feel the power and energy of these falls. 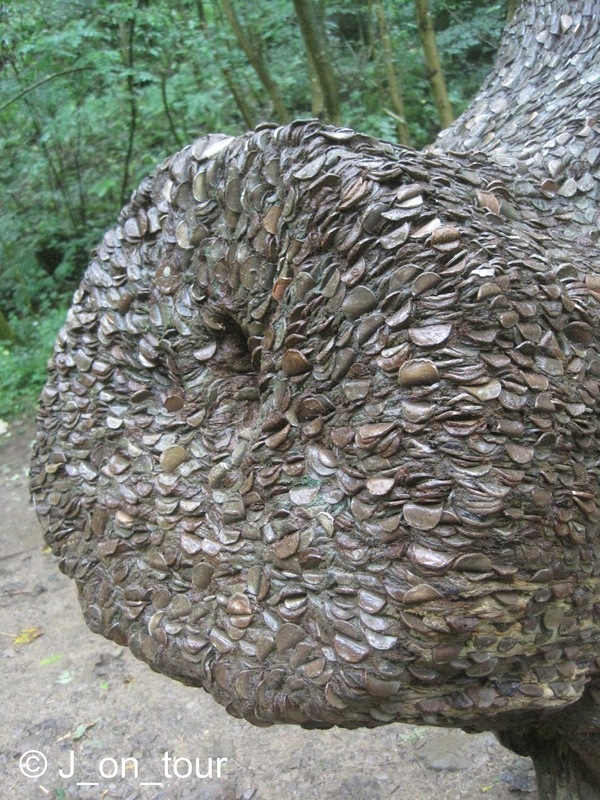 Very impressive tradition of embedding the coins in the tree! wow! WOW! i can feel the force of the waterfall, beautiful yet scary. Wonderful photography! I could almost feel the chill looking at those rainy waterfalls! I am sitting here in sunny, warm Florida with goosebumps! 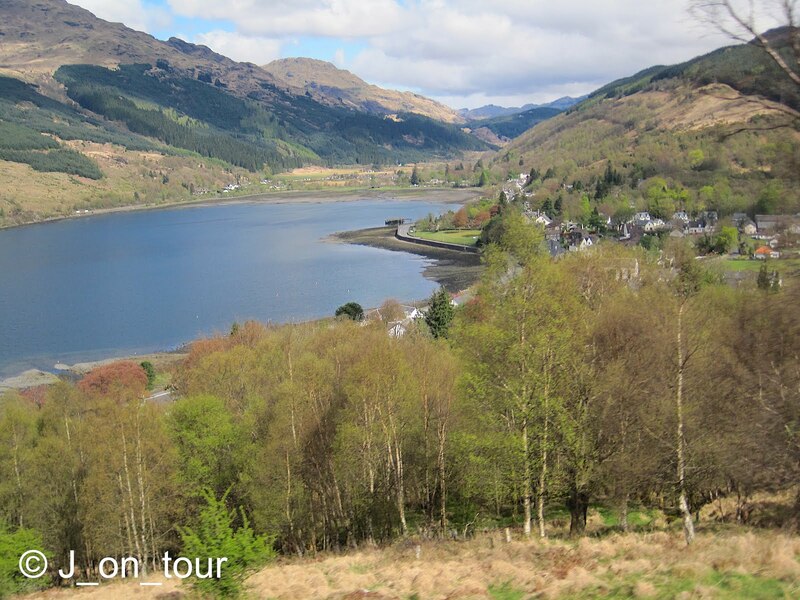 An expensive pleasure but a wonderful walk in this great landscape! Thank you for sharing it with us. Hugs from Luzia. great shots, great tale - thanks for taking us with you, through your wonderful narrative. love it! those rapids are pretty wild! I love waterfalls and those are quite impressive. Nice pictures eventhough it rained. That's a cute dog - I probably would have tried to adopt it. Glad you left in that shot of the bridge. I wish us both better weather. No way of diving or kayaking into this rough water!!! By the way 1- I like the blog’s layout! By the way 2- I love the “to be continued” stuff! Great series of photos. Don't think diving is really a good idea though, wet weather or not. That's a strong waterfalls current. I got scared (a little) seeing that current. I felt like I was with you on this trip. Thanks for sharing. Wonderful photos. This is very impressive and it looks like there is a lot of water... But it's magnificent! Sabe o que mais gostei no seu post? As nuvens baixas... diferentes... por aqui não temos... temos cerração... não sei se é a mesma coisa. Suas fotos estão muito lindas. Great photos! 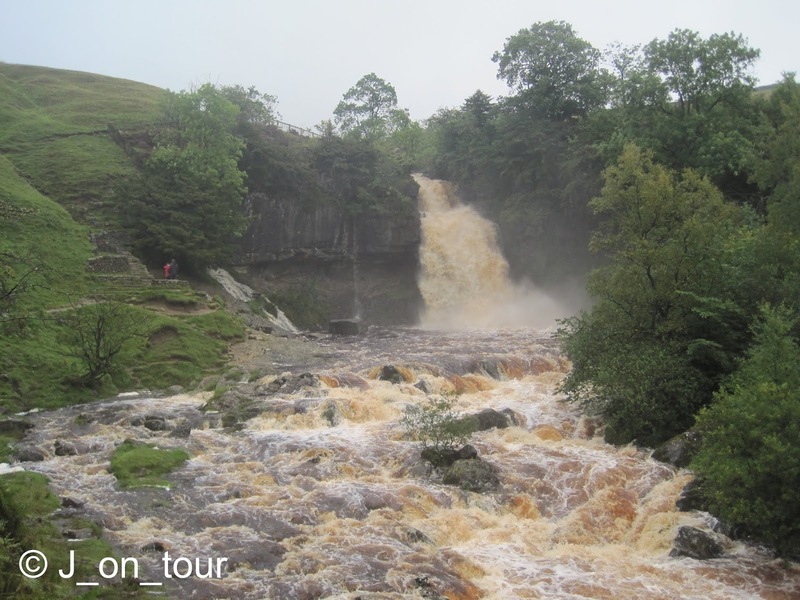 There was a bit of water in the falls by the look of it. 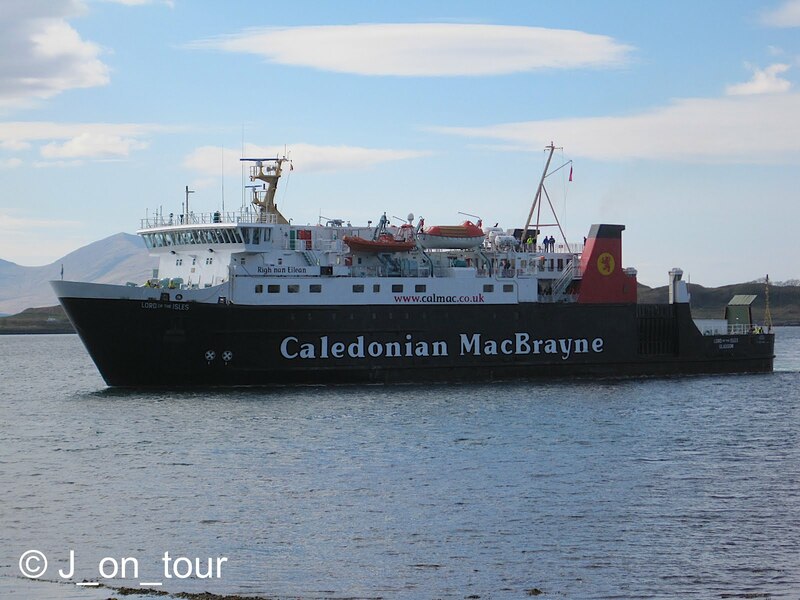 What a price to walk though - that just wouldn't wash up here in Scotland. Perhaps you should Photoshop the banner on the gate to read "Welcome to Yorkshire - Pay Here" ? Magnificent photographic adventure! The place looks spectacular! 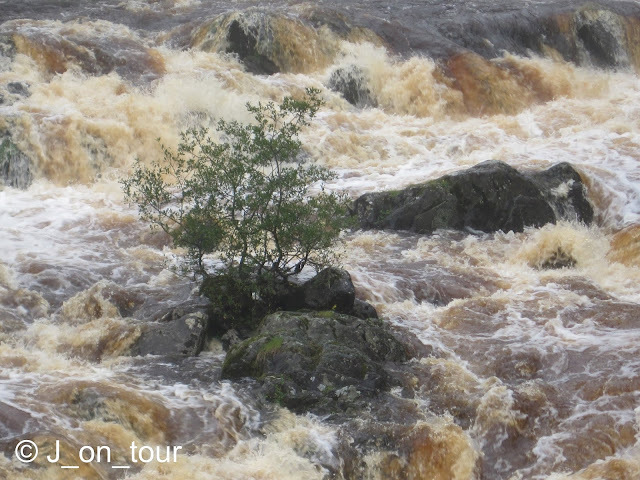 The river looks so strong and wild, it's impressive. And the rainy and misty conditions added certain atmosphere to your photos [and undoubtedly to your trip too ;-)], nice shots. By the way, 4.5 miles may seem quite a short distance when spoken about but in reality it can differ a lot. It's always about circumstances. Great post. 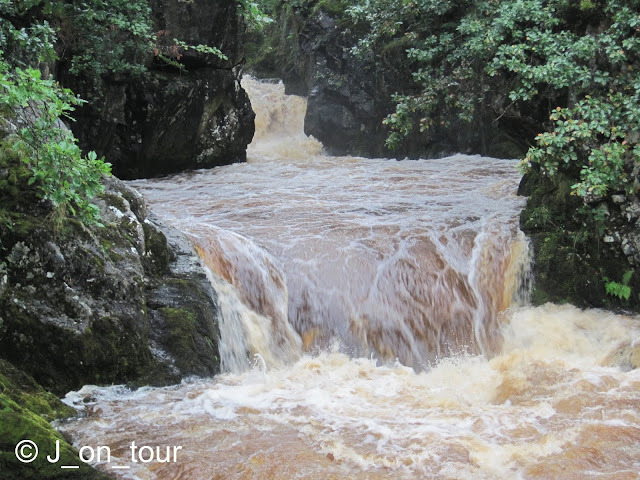 Love all the turbulent water shots and the cool bridge shot! I think it's a little difficult to have a great time when the weather is so uncooperative. Then again, I'm more forgiving of England because...it's England! What a great walk you just took us on! Love to see that in person! I think that you can take a lot of energy from there - also the sound is strong- like a Budhist Mantra! For a while the sound it stay inside of you, working! 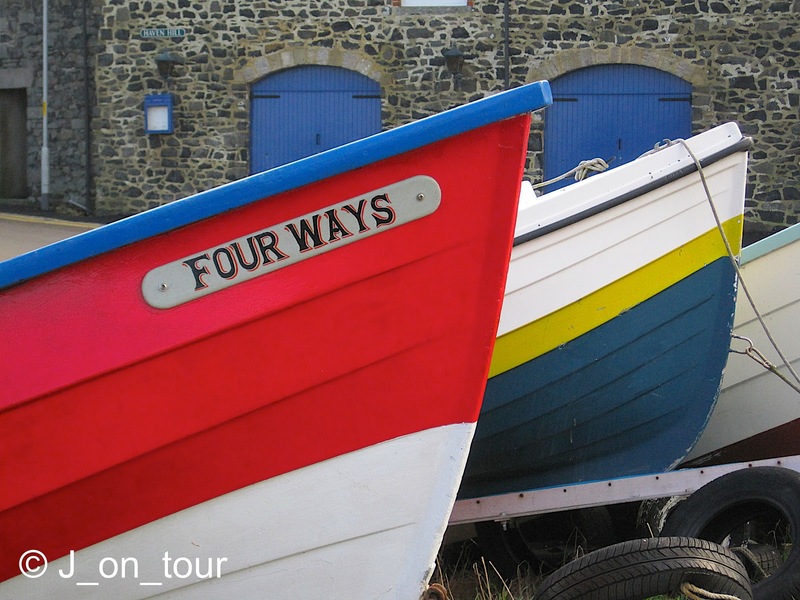 With those trips you change our souls too, because you keep us close to nature! Only to close my eyes end to enter! Great pictures. 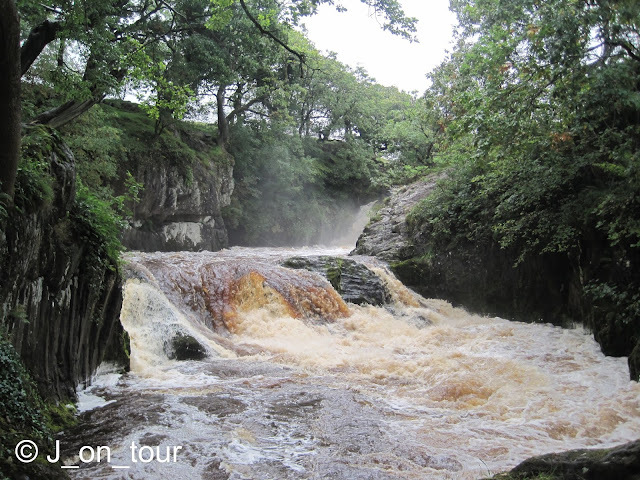 I live in Ingleton and wish I had more time to get round the falls. And I do love that last shot of the little dog. 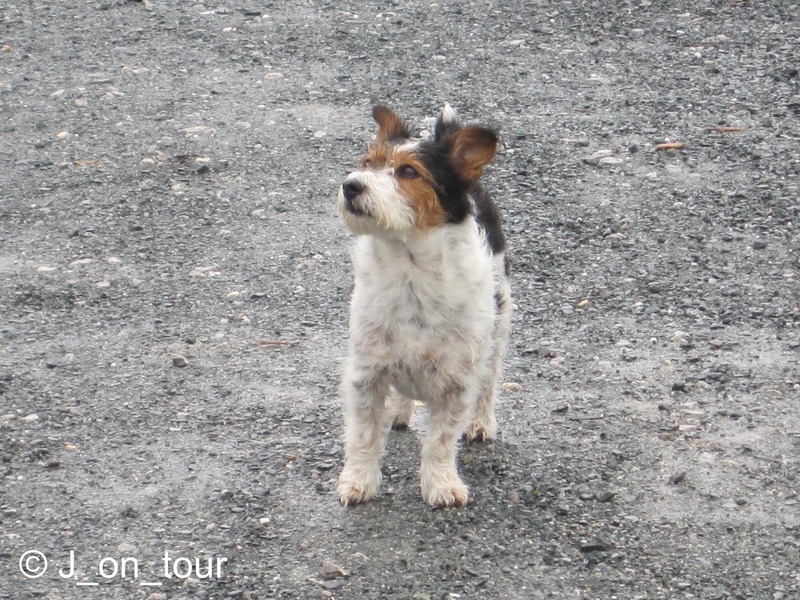 :-) Dogs should be included in every English countryside photo tour, cuz they seem to be everywhere. 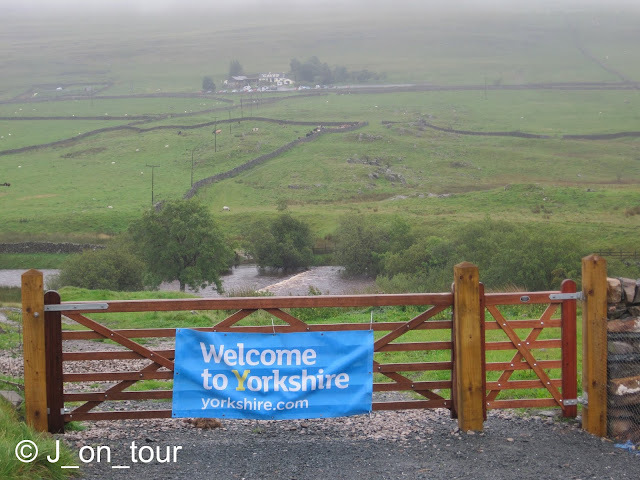 I wanted to ask you if you have ever been to Hardknott Pass and the Buttertubs Pass. If so, which is worse, in your opinion? I liked the light you catch in these photos it was very delicate, ..., and the dog in the last one. Farmchick... Thanks, pleased you enjoyed it. Jenny Freckles... The rain in the waterfalls was the bonus I was hoping for. Mike Knipe... I'm sure it cost a pound when I was last there. It would be interesting to know where the money goes... hopefully not on any more concrete on the return path. Adrian... Thanks, we seemed to forget about the money as soon as we saw the first waterfall. Sciarada... the falls were powerful particularly where photos 7 and 8 were taken. 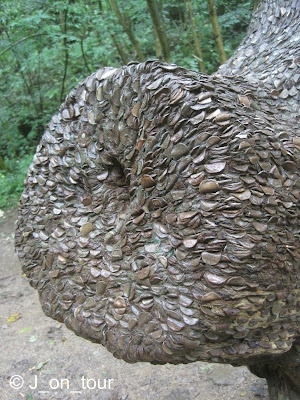 I've seen a couple of trees recently with these coins in. Lily Riani... I was a bit concerned that the waterfalls would look ordinary in the picture, on the other hand...that was the only bonus about this weather. Michelle... thanks for your visit, a little different to what you are experiencing. Luzia... 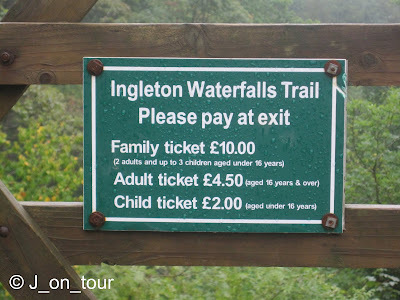 Thanks, as I said elsewhere here we forgot about the price once we saw the first waterfall. Gabriela Abalo... Thanks for your comment and your visit. Kae Lani... Wild water. If the drops were not so high, It would be ideal as a kayak course. Sweet Virginia Breeze... Thanks, I always look out for something unusual, but sometimes I have to rely on the occasional dog passing by. It can add a different angle to the post sometimes. JoLynne Lyon... Thanks for that, I'm pleased I left the bridge shot in as I'm trying to leave something of interest to the minds of the creative looking in. Vania Moreira... Yes, my friends were having some fun with me. Thanks for your comment about the blog layout, the right hand side pictures stay the same but I keep modifying the other layout as you know I had a problem lately with some features and it's not always obvious to find specific things like places... I'm trying to create an index of places. Living in Williamsburg Virginia... Thanks for your comment, a bit of fun about diving. Rizalenio... Thanks, I was pleased that the outcome looked real as if everyone was there. Phivos Nicolaides... Thanks, I keeping up to date with your blog, yours is full of travel variety. Mst try to get and see some of these places. No long distance trips this year for me unfortunately. Chris... Thanks for your visit and your comment. I'm sure you see spectacular things from where you live. Magia da Ines... 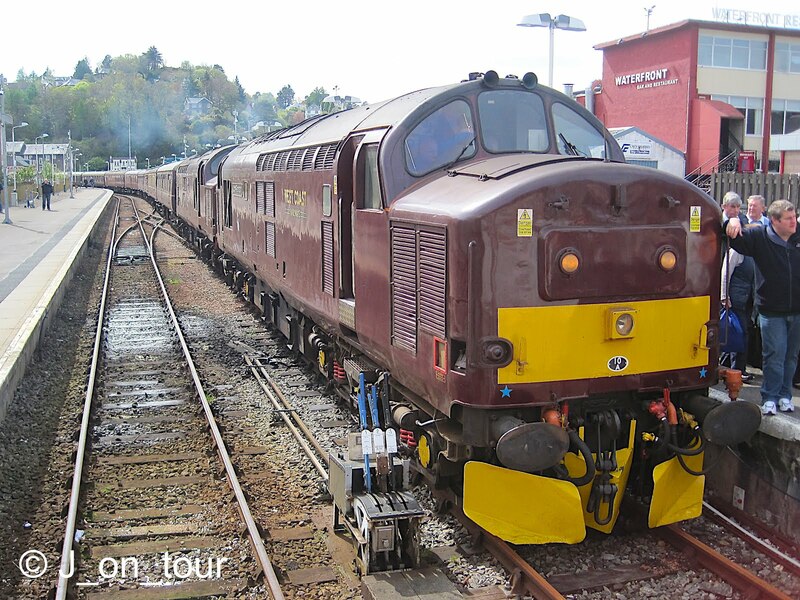 Thanks for your visit, pleased you liked it even though as you say it is different to what you are used to. 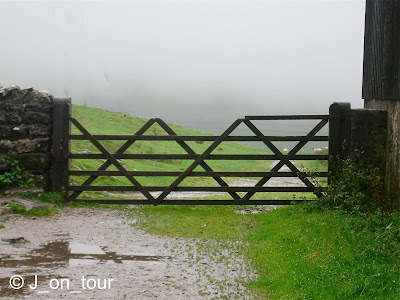 Ian... Great comment about the gate, never thought of that one... something to do with the Yorkshireman's wallet joke possibly !! Carraol... Thanks, yes this day did seem like an adventure. I had no idea that we were going to do this walk when I left my house that morning. Klaudia J... Thanks for your visit and your comment, you have some good things on your page too. Petra... impressive river, atmospheric conditions but the rain as it got worse at the end of the walk made the distance feel longer as we felt that we were never coming to Ingleton. Cranberry Morning... I suppose that's why it's called a green and pleasant land with all the water. I'll be looking for a hardare store in Ingleton to hammer all tose coins flat !! This dog was photographed near the "Yorkshire gate" and was a bit bemused on why it was brought here by the owner ! Hardknott or Buttertubs... I've done Buttertubs twice as a driver and earlier as a passenger. Hardknott... 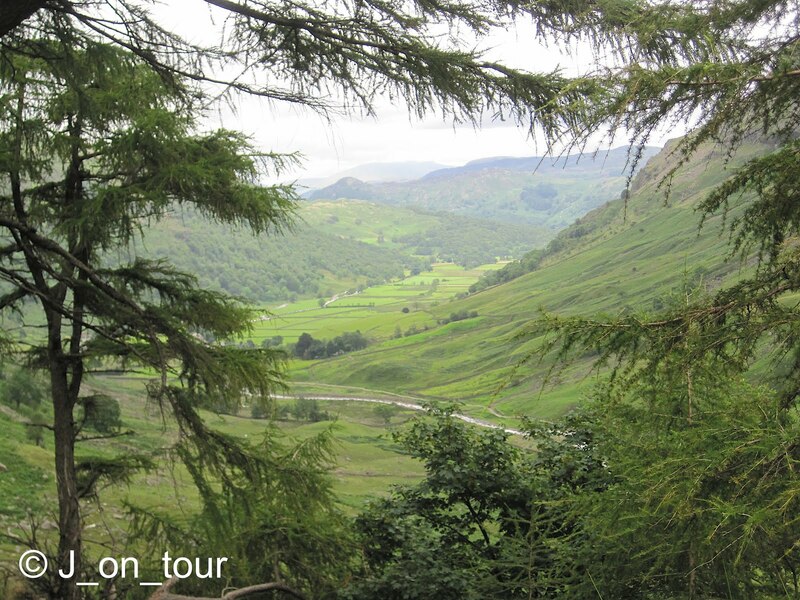 I wouldn't consider it, in fact I once drove 2 & 1/2 hours from home all the way around to Eskdale to climb Scafell. In a previous car, I had to turn back from Honister with a full car as I stopped on the hill !! T Becque... Glad you felt part of the experience. I always love looking at your pictures by the way. Wind... 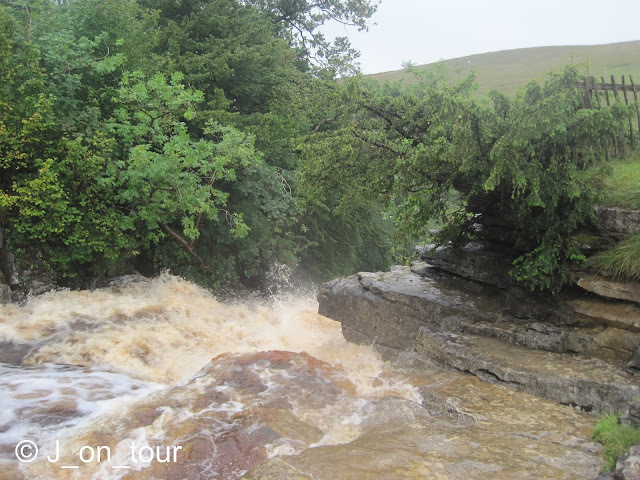 The rushing and power of the water stayed with us for a while. No need to worry about your English, you are doing great, If I can speak two words in Romanian like "good morning", I would think that I would be doing great myself..... that would add to the list of French, Italian, German and ... Aruban !!! You can enter my images by mixing Harry Potter with The Lion, the Witch and the Wardrobe. The only problem is trying to find the right room !! Peter McCabe... I'm humbled that a local person has picked up my blog. 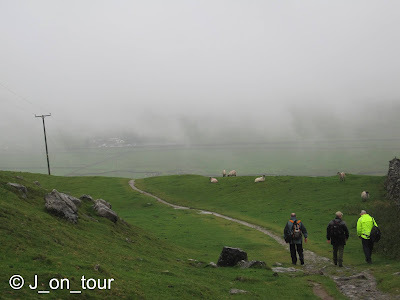 I hope I did Ingleton justice and didn't say anything bad about it in the following post !! Amin... Hello, Thanks for looking in, I'm keeping an eye on what you are doing too. Felisa... It's always good to see you. I always try to put something in for everyone... if I can. Linlithgow, Bo'ness, Blackness &... home.